Maritime silver can be divided into several categories, most notably that used aboard ship and that with a nautical theme. More unusual maritime silver used for tablewares include silver nefs - large silver models of ships mounted on wheels used on dining tables. These were used as a display of wealth and similar maritime silver pieces such as lighthouse salt shakers and galleon place card holders can be found. 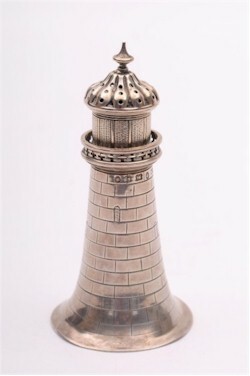 A Victorian silver pepper modelled as a lighthouse. Birmingham 1871. Maker Henry Manton. Silver boatswain's whistles are, perhaps, the most commonplace item that would have been used aboard ship by many of the ratings. Good scroll engraved examples of a silver boatswain's whistle regularly sell in the £300-£400 price range. Silver presentation salvers were often given by a ship's company to officers on celebrated occasions. Engraved with the ship's details and dates, these silver salvers are sought after by collectors, in particular, from ships that have been engaged in well know actions. 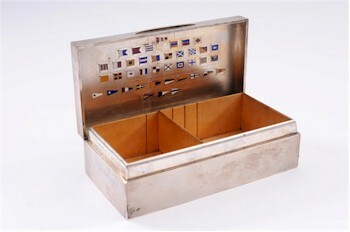 A George VI rectangular cigarette box with engine-turned decoration, the interior of the lid enamelled with maritime signal flags. The popularity of producing everyday items in the form of nautical atrefacts can be seen in such pieces as a silver inkwell made in the form of a ship's lamp. Miniature ship's lamps as well as anchors, oars and ships cannon were also made in silver as desk ornaments. Even cigarette cases were made in silver with a maritime theme, having enamel signal flags inset to the case itself. Many commemorative items have been produced from metal salvaged from shipwrecks and decommissioned vessels. Once again pieces produced from the copper of HMS Foudroyant, commemorating Admiral Nelson, are popular amongst collectors. These are often small copper medallions or walking canes with copper mounted pommels, with a portrait of the ship and another of Nelson to each side. Many of the great naval engagements and victories of the 18th and 19th century were commemorated by the production of a medallion. Once again, the more popular of these relate to Admiral Nelson and his time aboard both HMS Foudroyant and HMS Victory.